Sully is a black grey mouflon with incredibly wide horns with deep ridging. He is absolutely beautiful! He has a calm and friendly personality. He is conformationally correct with a verymeaty frame. He has a beautiful, soft, thick fleece as well. He comes from a wonderfully milky lines as well. His lambs are beautiful, vigorous and quick growing. is a solid black, horned ram that carries moorit and spotting. He has thick muscling and is long bodied. His mother was very milky and very motherly. His lambs are quick growing, vigorous and inherit his incredibly thick, wide, deep ridged horns. Dodge is a beautiful moorit horned ram. Out of a heavy milker and a wonderful ewe. He has gorgeous fiber and a wonderful temperament. Dodge has some great leadersheep genetics. Blesi is a Leadersheep Ram. Reykur is beautifully handsome spotted black grey ram. He carries moorit. Hugely wide and thick horns, fabulous fleece and build. Wonderful bloodlines and a great temperament. This ram won his lamb class and was reserve grand champion ram at the ISBONA sheep show in Hamilton, MT. Judge's comments included strong hind end, wide based stance, straight legs, thick back/loin, wide horn set, and an excellent fleece. Drafnar is a handsome polled black spotted ram. He carries moorit. quick growing, long bodied and out of a heavy milker. Beautiful fleece and a wonderful temperament. Kveikur is horned and white. Good looking head with good horn curving. Broad and thick neck. Good shoulder muscling. Very wide chest. Well muscled back and esepecially broad, muscled and rounded rump . Superb leg muscling. Very good looking ram with good temperament. Tan on head, feets and tail but very few tan fibers in the fleece. Even fleece, medium wool quantity and medium fine thog. Kveikur was bought after good results in progeny test at Hestur exp. farm. He carries on superb meat qualities, leanness, eye muscle depth and leg muscling. His progenies are also mature with good carcass grading. Colour inheritance Heterozygous white, carrying black but neither moorit or spotted. Colour inheritance Sokki carries all colors except moorit. White and polled with vigorous head. Broad and muscular shoulders. Broad chest and good rib shape. Broad and strong back. Long, broad and well muscled rump. Excellent leg muscling. Strong feets. Longbodied and very powerful ram. No tan fibers in the fleece. Average wool quantity. Thick and even thel. A bit coarse thog, short and mostly vanished on the back. 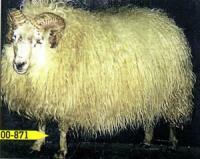 Bogi was used as a breeding ram at the very well known farm, Heydalsa, for four years. All those years he was superior in progeny tests. Bogi carries on superb leanness and is without any doubt one of the best polled AI rams regarding meat qualities. His daughters have excellent milking abilities as well as good prolificacy. Colour inheritance Bogi is homozygous white. White and polled. Broad and very vigorous head. Broad, rounded and very muscular shoulders and very good rib shape. Broad back and well muscled. Broad, long and well muscled rump. Very good gigot muscling. Dashing and vigorous ram. No tan fibers. Wool quantity well above average. Even and curly thog but rather coarse. Beautyful fleece. Somi was bought for AI after a big progeny test where his performance was excellent. He carries on good meat qualities, good dressing weight as well as good carcass grading. Somi has few daughter records yet but his indexes state that they are expected to have average prolificacy and very good milking abilities. Colour inheritance Somi is homozygous white. Moorit spotted and polled with broad and vigorous head. Round and muscular shoulders and good rib shape. Broad and well muscled back. Good rump and leg muscling. Straigth and strong feets. Rather longbodied and powerful ram. Light moorit color. Even fleece, lot of thel but very little thog. Wool quantity below average. Skrauti was noticed as a lamb at the Snefellsnes county ram show in 2007. In 2008 his progenies performed that well he was bought for AI'ing. Skrauti carries on good meat qualities, especially leanness. Skrauti has few daughter records yet but his indexes indicate that his daughters will hav average prolificacy and very good milking abilities. Colour inheritance Skrauti carries variation of colors. Grey mouflon with vigorous head and good horn curving. Broad, round shaped and very muscular shoulders. Very good rib shape. Broad and strong back and very muscular rump. Extremely good and well shaped leg muscles. Strong and well placed feet’s. Longbodied and vigorously looking ram. Grabotni was bought to Southram because of very good results from his birth farm. His progenies have proofed to have very thick eye muscle, leanness and superb gigot muscling resulting in very good carcass grading. Colour inheritance Grabotni carries grey and mouflon as his color indicates as well as spotted. Grabotni doesn't carry moorit. Ultrasound 2006: Eye muscle thickness 40 mm, back fat thickness 2,8 mm, muscle shape 5,0.